I developed the tiny slider, the Slim Jim, a number of years ago to imitate floating sand eels, silversides and anchovies. Fly rodders have successfully used the fly to take picky bass slurping small baitfish and worms in the surface film. Awhile back, friends of mine on Long Island shared stories of taking bonito and false albacore "on top," mainly using Joe Blados’s "Crease Flies". I was incredulous…tuna on top? With poppers and sliders? I thought they were joking, and from time to time I’d throw out a big Crease Fly or large slider, give it a few pops, nothing would happen, and I remained a disbeliever. But last year, word got back to me that a local guide, Mike Roback, had his clients nailing albies in the fast-moving water on the Watch Hill reefs, by dead-drifting and lightly "twitching" Slim Jims. Later in the fall I had a number of opportunities to try the Slim Jim on false albacore in a variety of angling situations and the results were……well, how does 22 hook-ups from shore, in one afternoon, sound? 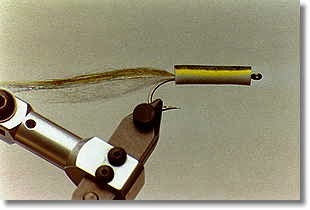 When fishing the Slim Jim use an intermediate line and a non-slip mono loop knot so that the fly can swing, dance and move. Try a variety of retrieves: dead-drifting, twitching, using long strips, even skittering and jumping the fly very erratically across the surface. The first time I fished this fly I watched in amazement as three false albacore came flying over each other’s backs in a race for the Slim Jim! Be prepared to lose a few flies or jump up in tippet strength, as the strikes are violent and aggressive. I have lost plenty of flies, and have had hooks straighten, or even break. All the "tackle busting" aside, the visual dimension of this kind of angling makes this an extremely exhilarating and satisfying experience. Once you take "tuna on top," you just might be spoiled for taking them any other way. The Slim Jim is commercially available in olive/white; black/white and all black from your Umpqua Feather Merchants dealer. Livebody Foam is available from Dale Clemens Custom Tackle in Allentown, PA or can be mail ordered from Hunters (1-800-331-8558 ) or North Cove Outfitters (860-388-6585 ). You can also make them to imitate your local baitfish colors, just change the color of permanent markers along the top of the fly. Tail: Polar White Mystic Bay Fly Fur, topped with three strands Silver Flashabou and three strands Dyed-Over-Pearl Olive Flashabou (Color #6969), topped with Olive Mystic Bay Fly Fur. Take a cylinder of the White Livebody foam and cut it in half. 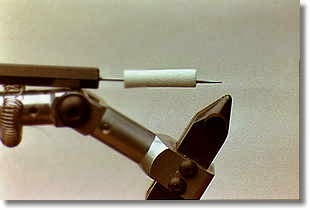 Using the thickest bodkin you can find, heat the bodkin needle over a candle until it is quite hot. Hold the foam so that the cut end rests flush on your desk. Push the hot bodkin straight down through the middle of the foam so that it comes out the other side of the foam in the middle of the cylinder (failures are common, and practice helps lots). Do this to both cylinders. Put the foam cylinders aside. Put hook in vise. 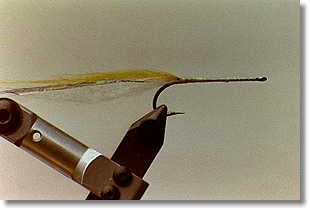 Attach thread and build up a good base of thread the entire length of the hook shank. 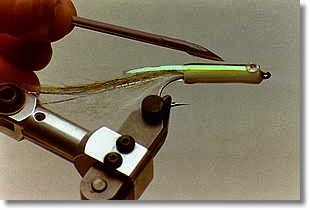 With thread between hook point and barb, tie in clump of Polar White Mystic Bay Fly Fur (pull out short under-fibers before tying material in). Top with Silver Flashabou and Dyed-Over-Pearl Olive Flashabou. Top flashes with Olive Mystic Bay Fly Fur. Whip finish and tie off thread. Take one of the foam cylinders and work the foam, through the hole you’ve melted in the foam, over the hook eye and down the hook shank, twisting as you go. Now, move the foam back off the hook shank and apply two drops of CA SuperGlue to the shank, quickly push, and twist the foam back over the hook shank before the glue sets. Color sides of fly with the Yellow Chartreuse marker. Color the top of the fly with the Olive marker. Leave a yellow chartreuse "stripe" the width of the pearl mylar tinsel. Cut two 2" strips of wide pearl mylar tinsel (Pearl Saltwater Flashabou is a good substitute). Attach the Witchcraft eye to the very end of each strip. 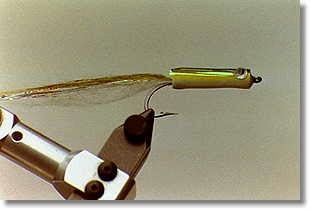 Attach the eye so that the mylar covers the yellow chartreuse stripe on each side of the fly. Cover the entire fly with a light coat of epoxy. When epoxy sets, trim the pearl mylar so that it is flush with the Livebody foam.